Hello and welcome to another Compendium of Curiosities III Challenges. Are you planning to play along with the challenges? Do you have your CC3 book? Are you curious to know the next challenge? You can check out all the official details on the Studio L3 blog. 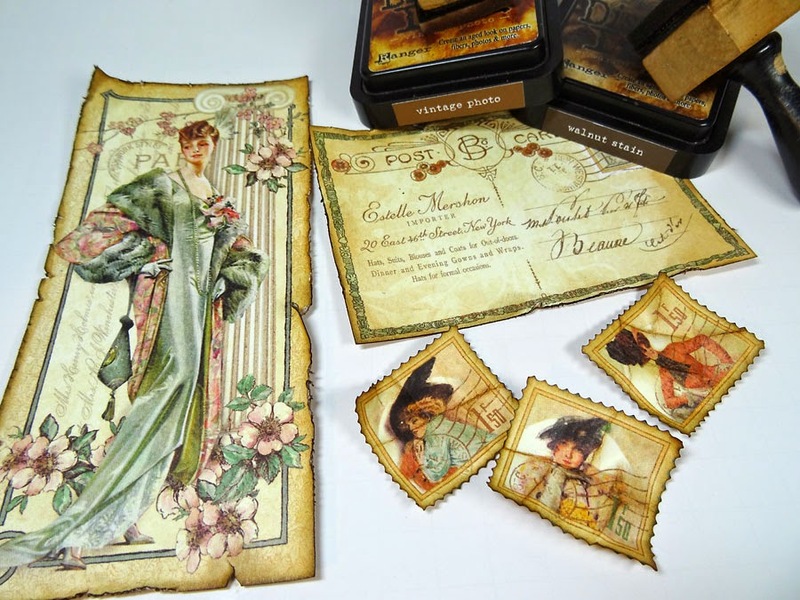 Then hurry and get your copy of Tim Holtz's Compendium of Curiosities Vol. III. Craft stores and scrapbook stores have it, but if you'd like a SIGNED copy from Tim himself, go here and order your very own. The next challenge "Distress Glitter" can be found on page 56 in the book. I had some serious fun with some new colors of Distress Glitter I purchased recently. It's different than any glitters I've used, and gives such great effects. For this challenge I decided on an 8 x 8 inch canvas. I used Spun Sugar, Peacock Feathers, Mustard Seed and Tarnished Brass. I started off by painting my canvas with Antiqued Bronze Distress Paint and sealed it with Glue & Seal. I knew I was going to adhere papers over the canvas, so I only needed to paint the outer edges and sides. I used papers from Graphic 45's "A Ladies Diary" collection. I cut a 7 x 7 inch piece, inked the outer edges with Vintage Photo and Walnut Stain Distress Inks, then did a zig-zag stitch with brown thread around the border. I cut apart some images, crinkled them up, distressed the edges, then inked the edges. This all gives a nice worn, vintage feel. Then I started applying some of my papers. 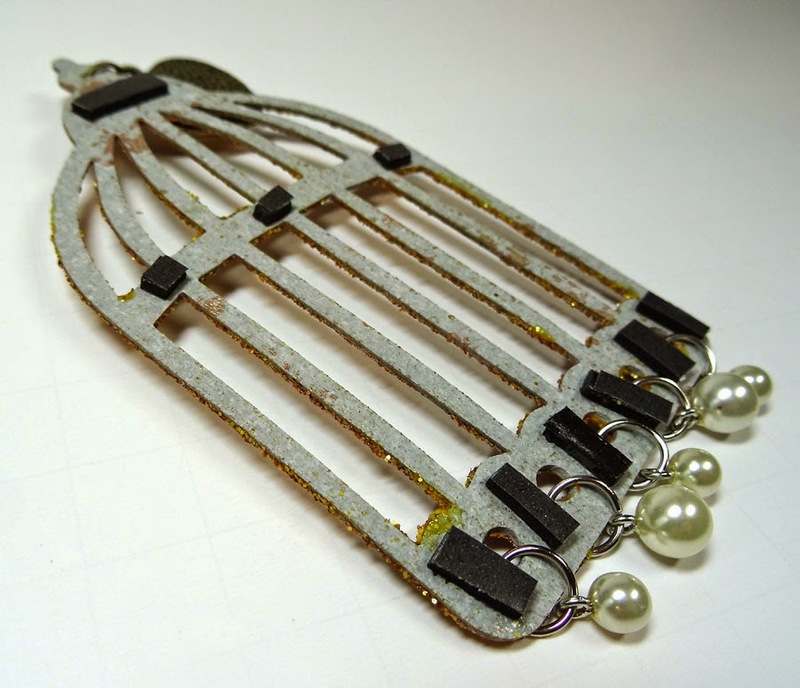 I cut a bird cage from Grungeboard and after applying the Distress Glitter, added some pearl baubles. I added foam tape to the back to pop it up on my canvas for added dimension. I used Tim's newest Trellis On The Edge die cut pieces apart and adhered them to my piece. Some faux vintage buttons add to the feel of my canvas. The Caged Bird die is probably one of my all-time favorites so I find I am constantly using it. It was my first Alterations die I ever bought and I still love it! For some added embellishment, I used the inside pieces from the Trellis die, glittered them and added them randomly to my piece. The Funkie Junkie is our sponsor this go-around. You can find all the Distress Glitter and many of the products I used today on their website. Thanks for stopping by. Now go get glittery! Loved your piece Annette, that shining birdie in the fabulous birdcage, it's amazing! Annette, wonderful job on your project, looks amazing! 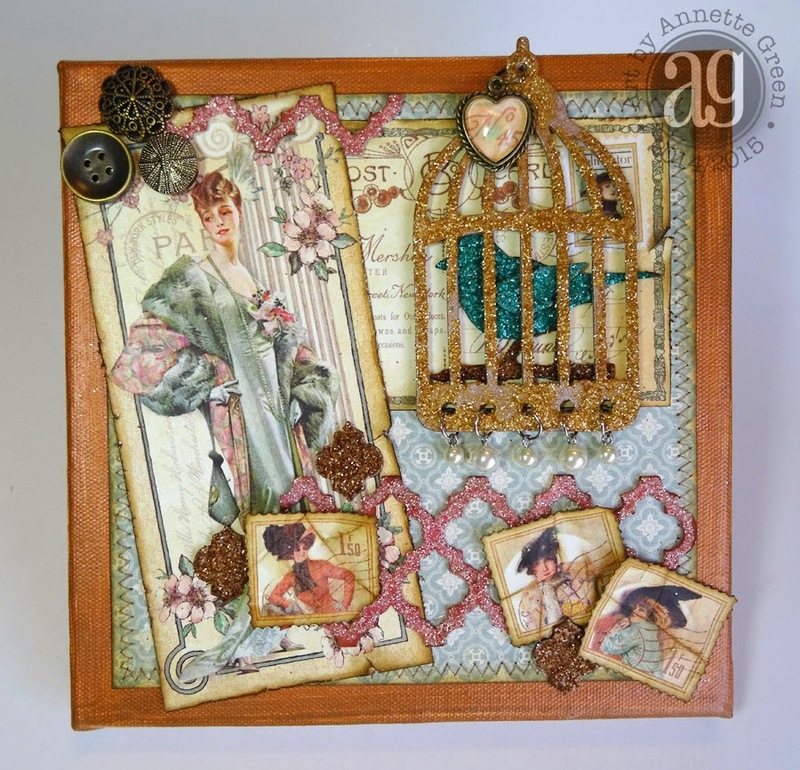 So lovely Annette, that Caged Bird is one of my favorite dies and you have made it look even more special. So wonderfully vintage :) I really enjoy the bronzed canvas with the glue n seal. Wonderful piece. I love the birdcage too. The bird looks great all in sparkle. SO CHIC Annette! LOVE the glittery birdcage, but the pearls make it luxurious! GORGEOUS!!! Annette-o-licious, from start to finish. Love your color mix with those beautiful G45 papers. Awesome! Stunning and great use of those gorgeous glitters! Wonderful use of those G 45 papers too, the two complement each other perfectly!! Beautiful canvas! The glitters look amazing on the bird and bird cage die cuts. Love the incorporation of the Graphic 45 papers. My eye went straight to the bird and its glitzy cage! Only when I looked at your lovely step out photos, did I notice the pretty pink lattice work die you covered with pink! Great project. Every element of your canvas is wonderful. The glitter makes things pop. So much beautiful detail. Love it. Fun Vintage piece with lots of elements. Love how the glitter adds the perfect amount of bling to this project. The colors and papers are gorgeous. Thanks for sharing with us. Great idea to use the canvas to support your layout! I love this Annette you chose some of my all time favourite pieces to create a wonderful work of art. Love your sparkly treat for the eyes Annette. When that birdcage/bird die was released the first thing I did was to glitter it up! Love this! Beautiful canvas Annette! I love your choice of glitter colors that you incorporated with the Graphic 45 papers! Love this Annette! Your glittered cage and bird are super with the heart and pearls hanging on them! Love this card... Its my favourite diecut! Your canvas is so pretty. I really love the different ways you used Distress Glitter to highlight and add sparkle to the different elements. Beautiful canvas! The birdcage is one of my favorites as well. I ordered the Trellis die last month and just waiting for it to arrive. It is nice to see how you used it. Wonderful!!! Your glittered bird and cage look fab!!! i love this piece and it works so well combining the glittery goodness with the Graphic 45. Great job! Lovely, Annette! You definitely took 'vintage' to the next level! Beautiful canvas! I especially love the glittered trellis pieces that have pictures tucked in! The birdcage is one of my favorites also, love your glittery version on your beautiful canvas! Must try the Funkie Junkie, they must have good things, love the name! Those framework dies are driving me mad, I love them so much and still have 2 to buy, the one you have so cleverly used being one. They look amazing with glitter. Caged bird was my first die as well! Love your canvas piece, So much Distress Glitter Goodness to look at! 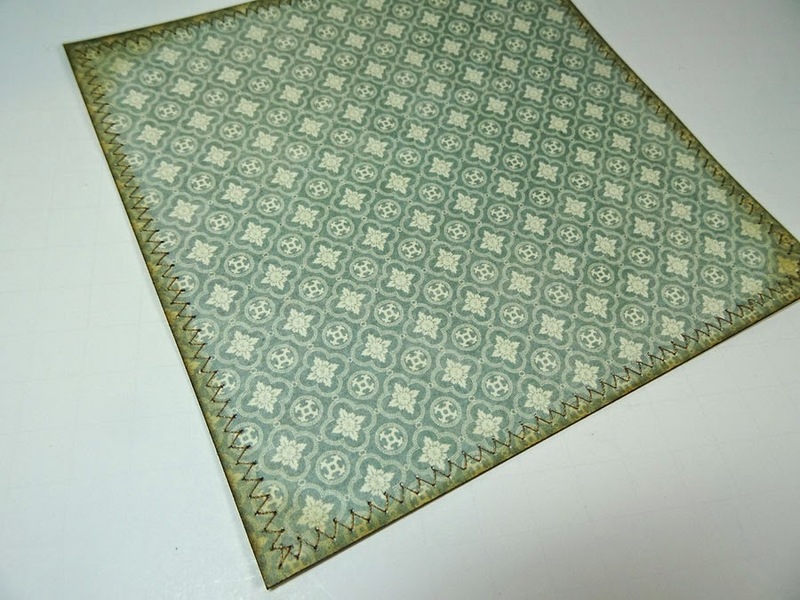 Really pretty vintage canvas, with a lovely touch of sparkle. So pretty - the glittering birdcage is lovely (though it glitters, it's still a cage!!)... and works so beautifully with the G45 papers. Sadly, I won't be able to play this time around... I didn't include my Distress Glitters in my travelling stash - bah! Very beautiful and elegant. Thanks for sharing some great inspiration with the distress glitter. Love the vintage feel. Gorgeous! Your bird cage and bird are just gorgeous. Thanks for the inspiration. I love the project ! I'm so glad I bought the Trellis die cut .. I have used it so much lately. Love those frameletts and your piece. How beautiful, Annette! Love how many different pieces you've blinged up with the DG - especially that gorgeous birdcage. So elegant. Love the gilded bird and cage. 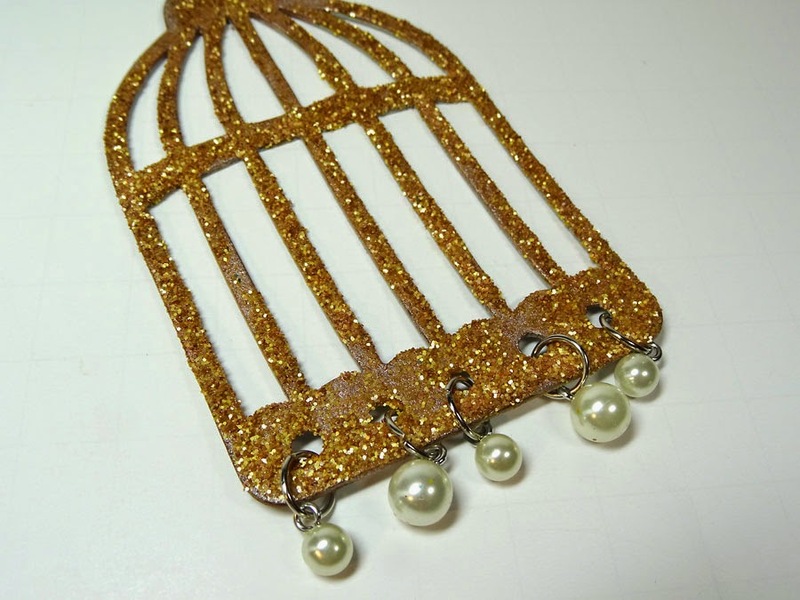 Lovely project - the glitters are just perfect for a gilded birdcage! Absolutely love, love, love, this piece! I hadn't even thought about making a canvas piece. I can't wait to try this! Wonderful piece Annette! Love the use of the trellis! Thank you for the inspiration! So soft and utterly feminine. The vintage style is so enhanced by these glitters. Fab Work! 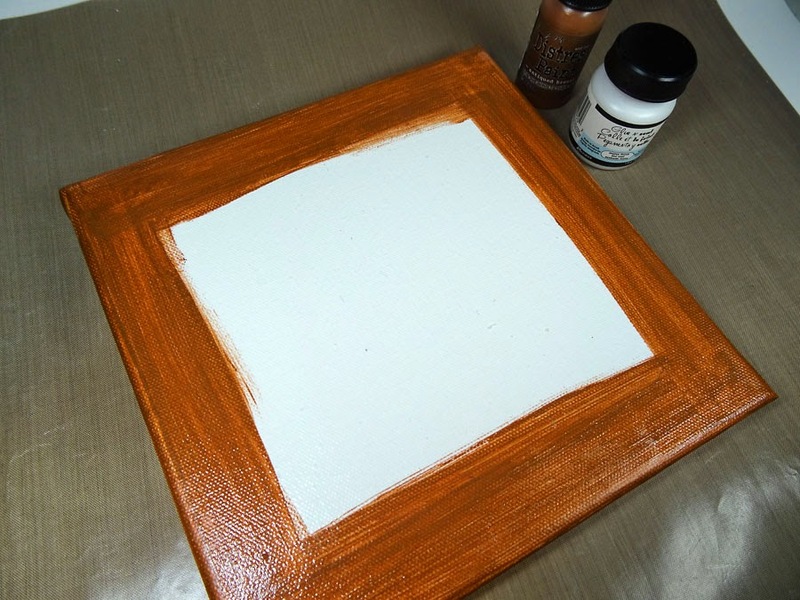 Love how you used the antiqued Bronze Distress Paint to give the look faux wooden frame. This is a wonderful piece. Glittery gorgeousness! Love the gilded cage. Love the vintage look and feel that you've achieved on your canvas -- just stunning. I LOVE this piece Annette! 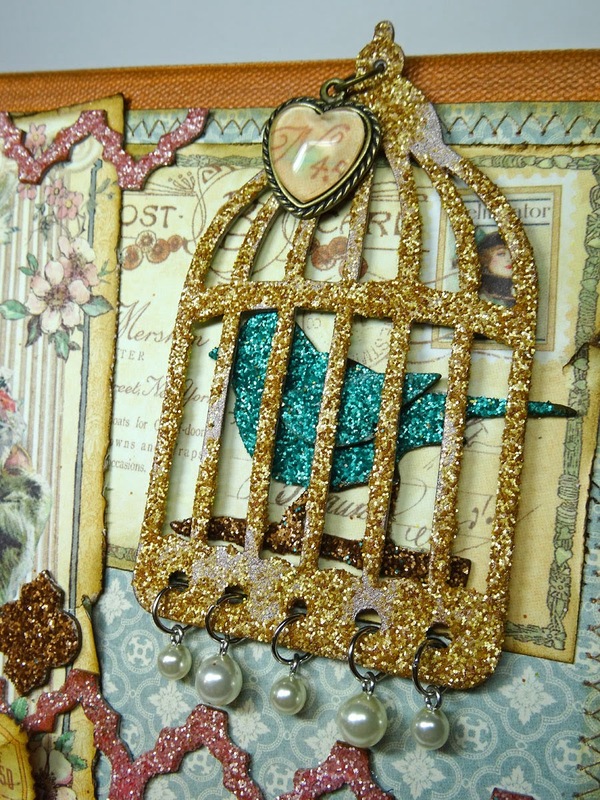 The bird cage is still one of my favorite dies, too and I love it glittered! Beautiful glittered detail Annette! The birdcage and lattice trim looks fab! Beautiful project! Love that glitter bird! I love the combo of G45 and glittery goodness! Love the vintage feel I get from looking at your canvas. And all your glitter blends right in! Wonderful work Annette! Foam tape is the BEST, isn't it? Literally "elevates" a piece to add beautiful dimension. I wouldn't be without it! The glitter looks amazing on that birdcage. The color are perfect for this lovely scene you've created, just beautiful. The color combination was perfect and those vintage buttons were just the right touch! This a beautiful panel, The classic style is great with the glitter accents. I am going to glitter the dies like this. Love the idea and the bird cage is such an eye catcher. 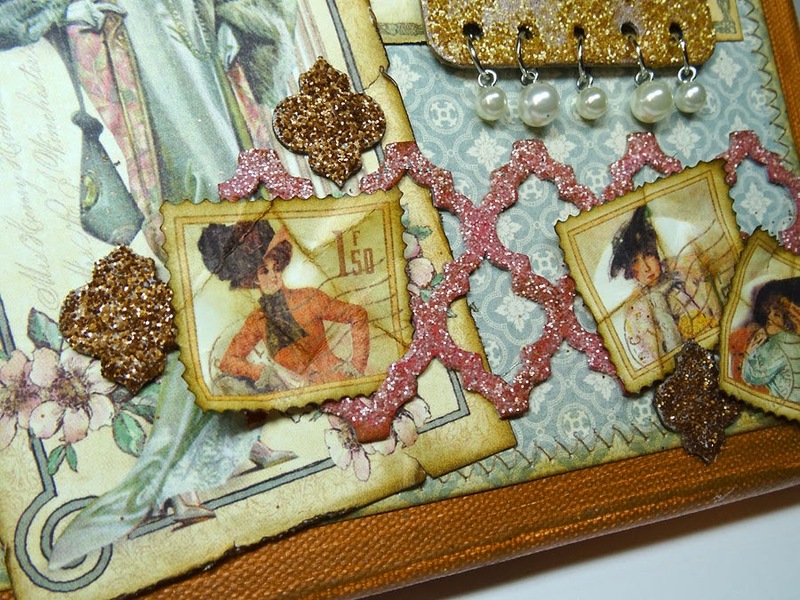 Oh Annette... you capture my loves here in your canvas Tim Holtz and Graphic 45... awesome play companions! Absolutely love what you did with lady from Ladies Journal...those colors of glitter so perfect! Love your work. 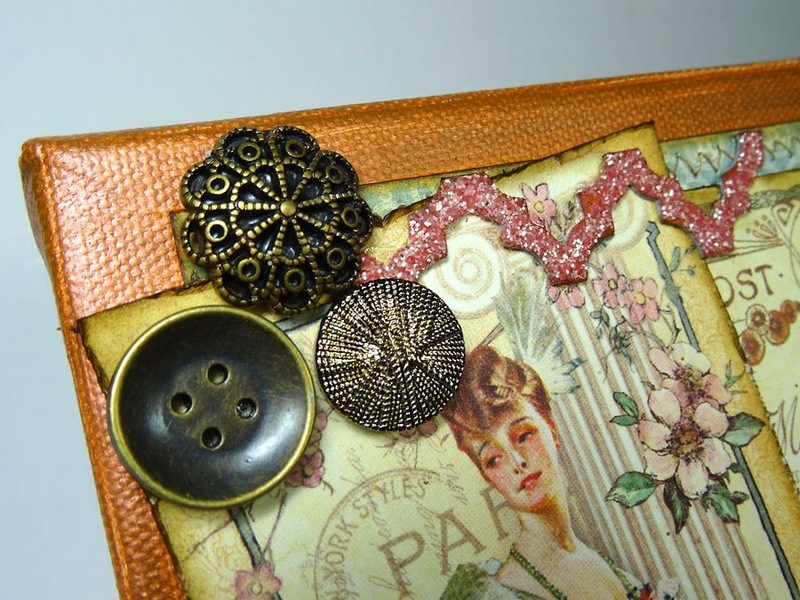 G45 and Tim Holtz products really go well with each other. The birdcage looks like it has been gilded and is so beautiful against those gorgeous G45 papers. Love your beautiful canvas! Lovely canvas. Thanks for the tip on distressing the images; mine have always looked to "new"..never thought of cutting/wrinkling. Wow-so much work and love was put into this creation-it's wonderful! Annette, love the canvas, such pretty colors. I know what you mean about having a favorite die, and it always seems like it's one of the firsts in our collections. A wonderfully stylish canvas Annette!love your bird and cage, the trellis looks so pretty totally in harmony with the images you've used love it ! What a lovely canvas. I've yet to try Distress Glitter. I need to give it a go. Beautiful artwork! You make it look so easy. Maybe I'll try a canvas next time. Thanks for the tutorial as it now looks possible to do. I always love your projects. Beautiful canvas, so much details! I always think that distress products go so well with G45 papers, and this is no exception. Annette, LOVE the ladies and the glittery bird and birdcage! Gorgeous creation! Such a beautifully put together piece, works so well and just enough glitter to sparkle! A beautiful bird cage, and lovely pieces in your collage, love it. a beautiful piece Annette!! i love the look of it... one of my favorite dies too! Beautiful work.... love all the glitter here and there. The bird is so cute...love the color. 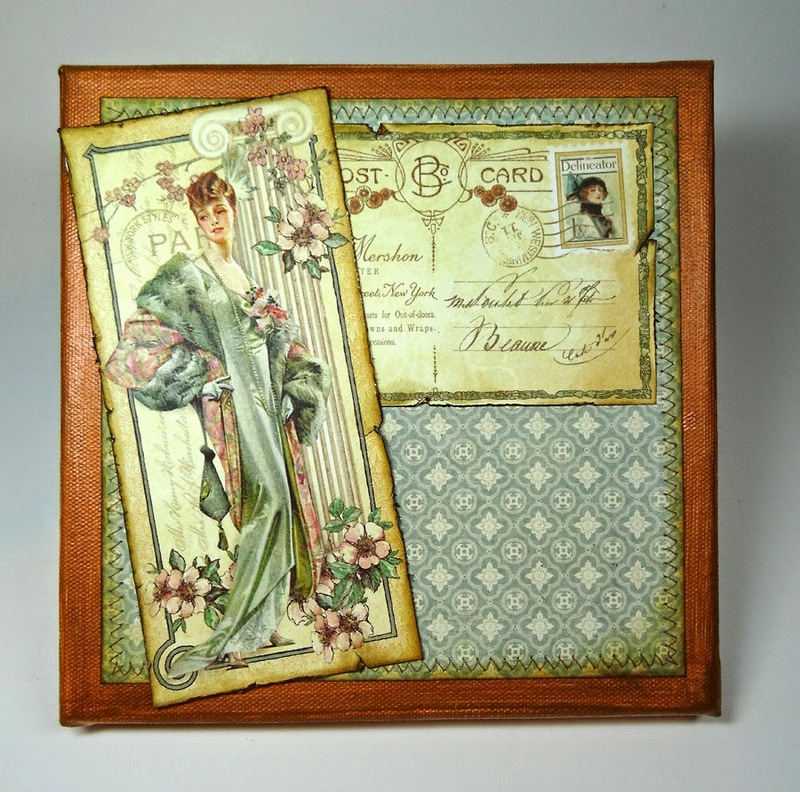 Love the vintage look of this piece Annette! This is so lovely! I appreciate all your photos, it helps in the process for noobies like me:) Thanks again for being a part of the Challenge Crew! What a beautiful example of the distress glitter technique and what fun colors! I love everything about your piece, Annette! Just lovely!